The mother of his children was being buried near her parent as guests - including many celebrities - said farewell. In an Instagram post shortly afterwards he called Porter 'the truest definition of a mother'. Singer Usher Raymond appeared dressed in green and gave Diddy a hug as they stood near where Porter was to be buried. The eulogy was read by Noel Jones while Bishop Marvin Winans and Mario Winans paid musical tribute. Others who gave reflections at the Cascades Hills Church in Columbus included Mary J. Blige, Dallas Austin, Ebony Electra, Marvett Britto, Diddy, and Porter's son, actor-and-singer Quincy Brown. Quincy broke down as he spoke and was joined at the mic by his father, Al B. Sure!, and Diddy. Diddy's son Christian 'King' Combs - who has followed in his mother's footsteps by becoming a model - was present. 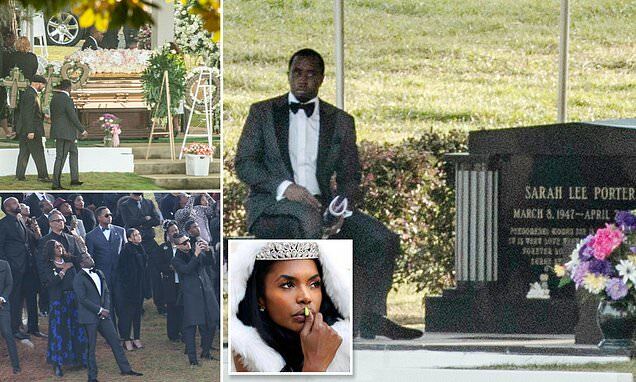 On Friday, Diddy hosted a private service at Charles E Huff International Funeral Home. Diddy - along with sons Quincy Brown and Christian Casey Combs - was seen leaving the service. She gave birth to Qunicy in 1991 while dating producer and artist Al B. Sure! starting in 1990. Porter and Diddy share three children together, twin girls Jessie James and D'Lila, 11, and 20-year-old son Christian. The couple had been on and off for 13 years and following their split, the pair continued to co-parent their children and remained like family with one another.